Business logo favors are great to strengthen your company's brand. Whether you are planning a corporate event, company party, company holiday party or a special promotion, you will find the best selection of corporate logo favors for your employees and clients here. My unique collection ranges from personalized mini bars to personalized chocolate bars. See other listings within www.etsy.com/shop/uniquelydesigneditem for additional thoughtful and classy corporate favor ideas. 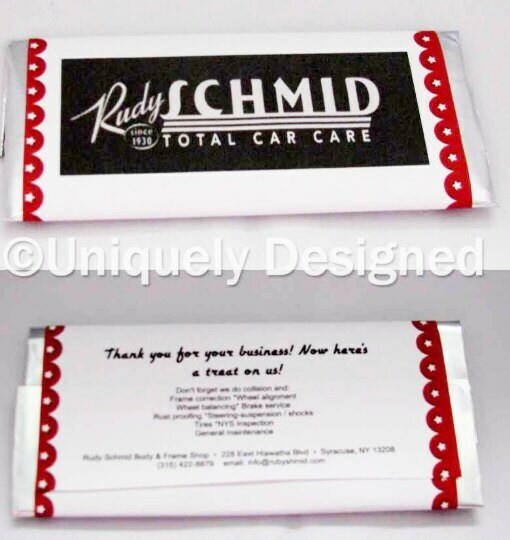 Your customers are sure to remember you when you hand out these full sized Hershey bar promotional bars! Or use them as thank you gifts too. 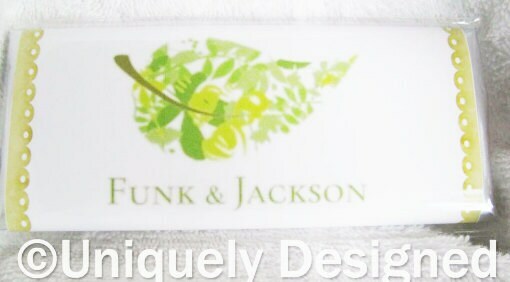 We have customers such as lodges and hotels that put them on guests pillows. Or we also have insurance agents, coaches and other businesses that use them to let people know about their business. Believe me, they won't throw out the wrapper! Its a great way to tell your customers about new products (on the back or the bar) or remind them of your other services so they won't forget. These are the perfect business promotional gift! We have businesses that give out these Hershey bar business promotional items at Christmas but also end up doing it all during the year for special events or at speaking arrangements. Ask about having it shipped to the hotel you are staying at. Overnight delivery is possible to get it to the hotel on time. And you won't have to carry them. 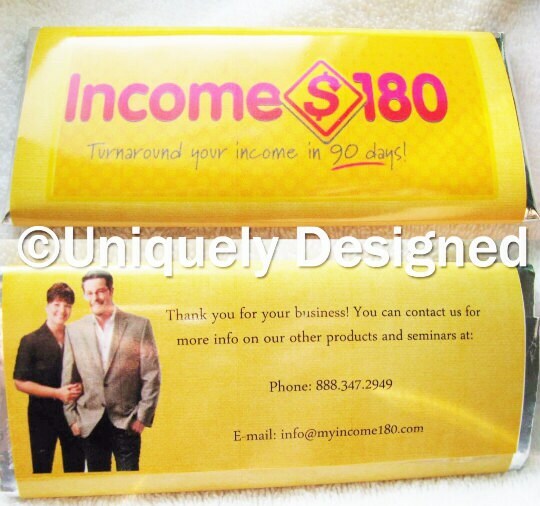 Note: we can add a coupon printed on the inside of the wrapper for a flat fee added to any order. You can order as many or as few as you like. Just convo me for a custom order or to find out more information! Comes with: foil, a plastic sleeve, your custom bar, and of course the Hershey bar! Everyone will be talking about the business that handed out chocolate!